How do you do the apple diet for 3 days? It's so easy, but before you do you need to know about the benefits of eating apples to change your perspective. The apple diet is a replacement diet that you do for 3 days that when compared to normal eating habits is lower in calories and said to be the secret to eating as much as you want without going overboard into the high calories range of food consumption. Is going on the apple diet effective for losing weight? For people with the words I need to lose weight right now on the verge of leaving their tongue the apple diet may be the juice that you need to slim down cutting back on calories without starving dietary restrictions of other fad diets. In this next Slism, we will go through the 3 day apple diet to lose weight and cleanse your body going into detail on some of the benefits particular to an apple diet followed with areas to watch out for when considering starting losing weight on the apple diet. Amongst other things the apple diet is a well-known single food complete diet as well as a replacement diet used in substitution to normal healthy eating habits to quickly decrease your calorie intake while acting as a colon cleanse. 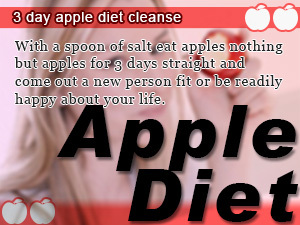 As for diets go the apple diet may be the simplest there are. All you have to do is eat nothing but apples for a 3 day period. Although one of the strict requirement of the apple diet is to abstain from eating nothing but plain old apples throughout the course of dieting, one degree of freedom that it gives you is letting you eat as much apples as you want. This alleviates the fear of getting hungry. For this very reason, the apple diet is considered a half-fast diet, which doesn't restrict your food intake. Commencing the completion of you 3 day apple diet cleanse one side effect is the lowered functionality of your stomach after digesting nothing but apples, which makes getting use to normal eating a potential obstacle in your diet. After getting back on your feet, avoid eating fatty foods eating easily digestible foods until your digestive tract is back up to one hundred percent. While you are in middle of the apple diet it wouldn't be right to eat foods other than apples. However, when it comes to hydrating your body, don't resist drinking to your delight. That includes drinking beverages other than water including tea and coffee with one word of precaution. Be sure not to consume too much caffeine to avoid digestive trouble during your diet. An apple contains less than 200 calories. This leaves a lot of room for eating considering the amount of calories recommended by daily calorie intakes. That is why it is said that going on a 3 day apple diet cleanse will not only flush your system but help you lose weight as well. In a 100g serving size there are only 54 calories in apples. When looking at a whole apple (225g) that's only 122 calories with 0.45g of protein, 0.23g of fat, and 32.85g of carbohydrates that means you only have to take a 46 minute walk to burn off the calories. Eating apples serve as an excellent method to getting all the dietary fiber your body needs to promote colon health. On top of that apples are said to be rich in the water-soluble dietary fiber pectin that serves to jellify salts, sugars, and fat, nutrients that get started away as fat, serving as an active fat blocker. In addition, it is said that the pectin is said to be contained mostly in the skin of apples, just another reason why you should not be throughout away the skin when eating apples. Apples also contain a dietary fiber called cellulose that is said to help detoxify your body sending toxins out cleaning your system as well as stimulating your digestive tract effectively relieving constipation promoting healthy gut flora. Apples contain a substantial amount of polyphenols. In fact, there is a polyphenol particular to apples that are referred to as the apple polyphenol with antioxidants that helps slow down wrinkles on your skin producing an anti-aging effect in addition to curing bad breath, reducing cholesterol levels, and most importantly beautiful young looking skin. The probiotic effect of pectin contain in majorly in apple skin. In addition, it is said to contain as much as 4 times the amount of polyphenol found in apple fruit, all found in apple skin because besides the rumors driving people to throw away the skin, it is actually good for you, combining probiotics for digestion and antiaging for your skin. As for the result you get going on the 3 day apple diet cleans and completing without breaking the rules, all that can be said is that you will notices some changes in your body, good and bad. During the initial period of the apple diet, your body will experience a sharp drop in consumed calories. However, because the apple diet is routinely used to lose weight fast just as other single food complete diets are prone and highly likely to put the weight back on immediately if you are not careful. In returning into your normal eating routine, it is likely that your weight will revert back to where it was before going on an all apple diet. For people who really want to try out the apple diet for themselves but are worried about putting wasting their effort try increasing muscles mass building a strong metabolic rate before going on the apple diet. This would allow improved fat burning and lower the chances of putting it all back on. Believe it or not there are fruit diet plans for just about any fruit you can think of including the healthiest fruits you can find on the planet. Explore fruit diets for more exciting ways to cut back on calories without giving up on vitamins bridging together fasting and healthy eating. With a spoon of salt eat apples nothing but apples for 3 days straight and come out a new person fit or be readily happy about your life. 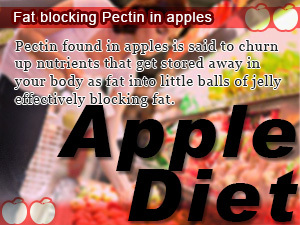 Pectin found in apples is said to churn up nutrients that get stored away in your body as fat into little balls of jelly effectively blocking fat. 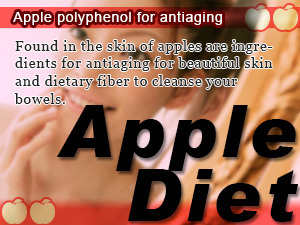 Found in the skin of apples are ingredients for antiaging for beautiful skin and dietary fiber to cleanse your bowels.